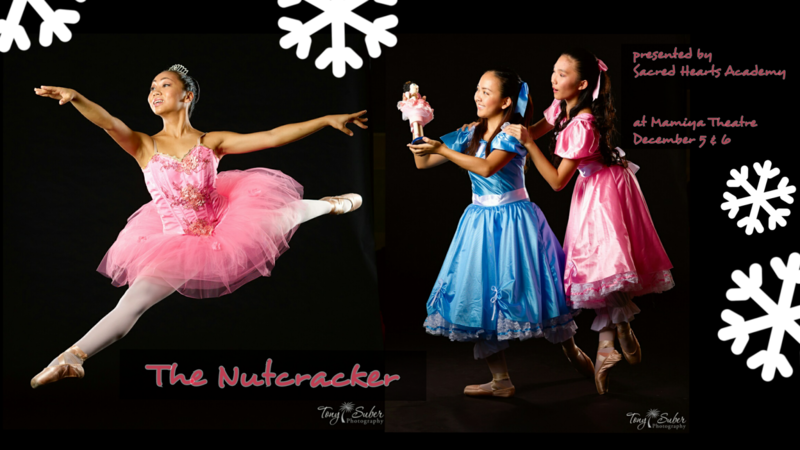 Sacred Hearts Academy - The Blog: Sacred Hearts Academy's Dance Department presents "The Nutcracker"
Sacred Hearts Academy's Dance Department presents "The Nutcracker"
The Dance Department has been busy rehearsing for this year's classic holiday performances of The Nutcracker. They have made appearances on KITV and KHON and have another appearance scheduled on Hawaii News Now. Tune into Hawaii News Now on Thursday, December 4, at approximately 8 AM to see Megan and Angel treat the viewers to a preview of Friday and Saturday evening's performances at Mamiya Theatre [Google Map]. Reserved seating is available at http://www.sacredhearts.org/tickets/. Below is a clip from the KITV appearance.